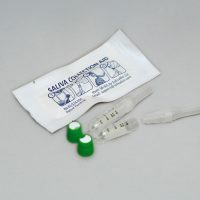 SalivaBio’s Saliva Collection Aid has become a worldwide industry standard in salivary bioscience for passive drool saliva collection. In retrospect, many early saliva collection techniques in the published literature were causing interference with assay quality. “Substantive progress in advancing our understanding had to be put on pause while we carefully worked out the details of how to collect, handle, transport, and store saliva specimens,” says Dr. Granger. “We learned early on that some swab materials acted as a filter and interfered with the nature of the sample in ways that we could not predict. At the time, salivary research had not fully elucidated the biology of oral fluid. Passive drool was preferred by researchers because it represented a minimally manipulated sample.” However, in the beginning, there was no easy way to facilitate passive drool collection, which led to poor adoption by investigators in the salivary bioscience community. Passive drool was also difficult for some participants and no universally accepted device was available to easily facilitate the transfer of saliva from the mouth to a sample storage container. Many investigators consider saliva collection a novel decision, but research shows that sample collection has a tremendous impact on data quality. “It’s often a decision most researchers will make unknowingly, without considering the downstream implications to sample quality or processing efficiency,” says Supriya Gaitonde, Ph.D., Salimetrics Senior Applications Scientist. “For the two major decisions facing salivary bioscience researchers, we have this saying; “Collect Right, Test Right.” When you distill it down like this, it’s not complicated.